Benson has been granted a reprieve. 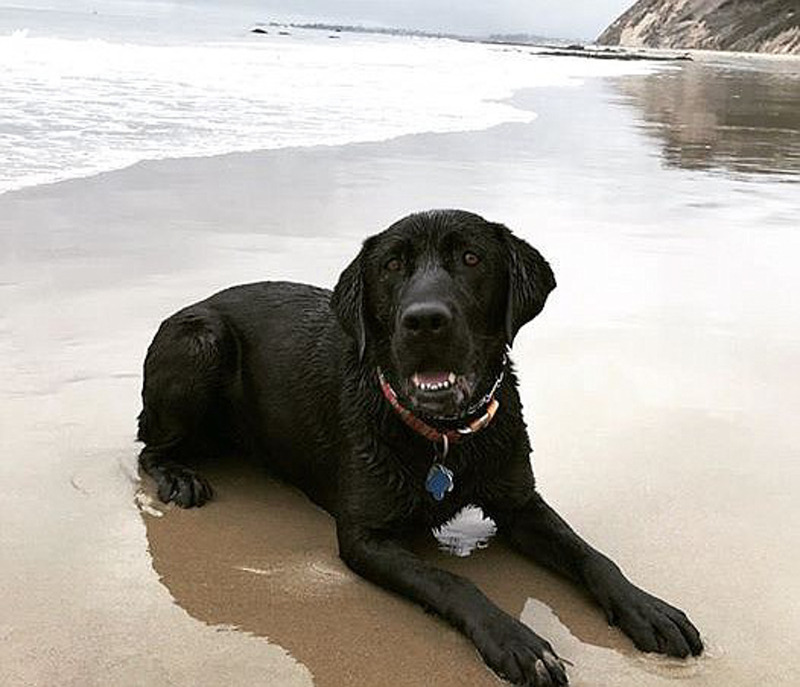 The City of Goleta, which ordered the black Labrador retriever euthanized after he bit a woman and killed a puppy while off-leash, came to an agreement with the dog’s owners to release Benson to Shadow’s Fund in Lompoc. In exchange, Michael and Kelsey Hill have agreed to dismiss their appeal of that order and pay Benson’s costs at County Animal Services. The Hills had adopted Benson from DAWG (Dog Adoption and Welfare Group), which has a “no kill” policy and had taken Benson from Animal Control to work on his behavior of growling and biting at his tail. A Labrador retriever is a very adoptable dog, said DAWG trainer Brian Glen. It took about six months, he said, before simple distraction training enabled him to remove the cone placed around Benson’s neck to keep him off his tail. He was a big Lab, high-energy, and the Hills seemed a good fit as a young, athletic couple who’d owned big dogs before. Glen said he worked with them on the dog’s need for exercise, leadership, and guidance several times before they took the dog home. The Hills continued working with a private trainer, who declined to comment. Benson may not have been socialized well as a puppy, Glen speculated. When he met the neighbor’s puppy, which at nine weeks old might also have been too young to understand Benson’s cues, the big dog grabbed the puppy and shook it. The puppy was soon euthanized by a vet because of her extensive internal injuries. Because they were neighbors and wanted to get along, the puppy’s owners didn’t file a formal complaint about the attack. They accepted the Hills’ help in paying for the new puppy and the previous one’s medical bills, but they didn’t trust Benson any longer and worried about the Hills’ new baby. It was a second attack while off-leash that got Benson sentenced to death. Michael Hill was throwing a ball for Benson at La Patera school on a Sunday, when another neighbor came walking her two six-month-old golden retrievers around the perimeter of the grassy field. On a pathway lined with a six-foot hedge, Benson came growling and running after them, she said at Goleta’s administrative hearing. He leapt on them, grabbing one puppy by the throat, while she straddled Benson, wrestling him off her puppy. The screams were heard for blocks around. She fell to the ground, then held him off with her arm while he tried to go for her face and neck. Hill pulled Benson off, but the woman had a gaping wound in her arm that was stitched at the hospital. The two attacks happened in July and October, and in November an administrative hearing was held by the City of Goleta, which resulted in the euthanasia order in December. Feelings were high at the hearing, with Mike Hill testifying in tears to save a “family member.” It was traumatic for the victims, who asked for anonymity; one has already received harassing calls and emails from Benson supporters. The hearing room was half-full with them, and DAWG projected photos and a video of the dog, which brought the attack flooding back, the dog-bite victim said. Unexpectedly, the Hills brought an attorney, Alan Fenton, who raised objections on procedural grounds and questioned whether the victim’s arm injury might have been caused by her own dog’s training collar. When he asked if a doctor’s report verified a dog bite, she replied, “I was in the hospital, you piece of … ” but was shushed by her son. The hearing officer, Vyto Adomaitis, the city’s director of public safety, brought the cross-examination to a close at that point. Shadow’s Fund has sheltered dogs since 2009, taking in the canines not likely to be adopted either due to age or breed. The nonprofit agreed to keep Benson, work with him, keep him on a leash during visits to the vet, possibly adopt him out to an experienced handler or sanctuary but not the Hills, and never allow him within the borders of the City of Goleta again. The Hills have not responded to requests for comment. [Update] Kelsey Hill contacted the Indy after this story was posted to confirm she and her husband had dropped the appeal. She stated Goleta would be reviewing its “inhumane animal laws” in light of her dog’s fate.